"The adventure starts when things stop going as planned” Well the adventure has sure started. 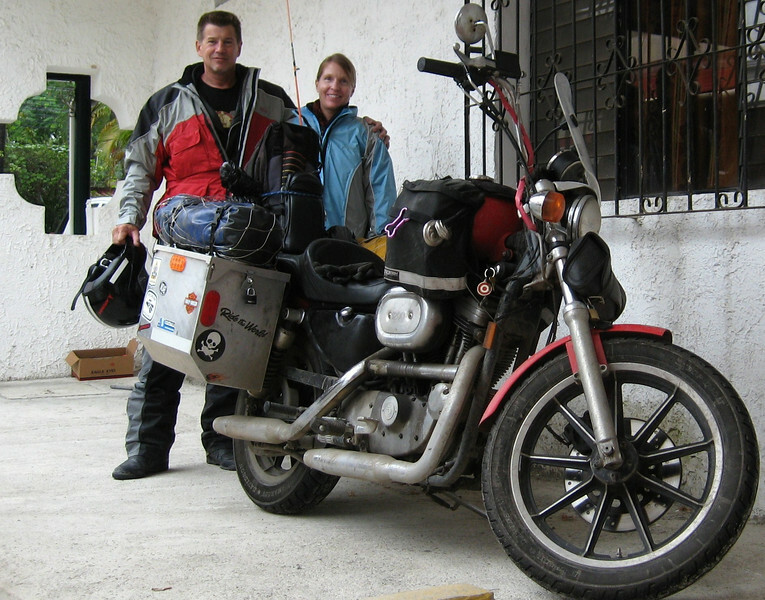 With all our grandiose plans for the holidays, we ride off to the Caribbean coast looking to put us and our motorcycle on a ferry sailing to the island Roatan. Roatan is reported to be one of the most beautiful places in Honduras with turquoise waters, great beaches and a lot of fun things to do. The concern is the lodging may be filling up over the holidays so we book reservations over the internet for a cabin on the beach. We are set, all we have to do is find the ferry doc and wait to set sail, no problem. We pull into La Ceiba before noon. La Ceiba is the village where the ferries dock bound for Roatan. We find the ferry dock and locate the ferry then proceed to check in. When we get to the cargo area the person in charge informs us that because of the heavy cargo loads over the holidays we will not be able to transport our motorcycle to the island until after the New Year. I feel myself ‘in my mind’ turning left, then right, then left again trying to figure out which way to turn to get our bike on the island. This is not good, we have nowhere to turn. Heidi looks like she wants to cry. So close but now it is on to plan-B, the problem is there is no plan-B. Heidi and I spend the next hour looking around town for a container ship that is suppose to set sail at 2:00 AM for the island. We ride from one end of the town to the next and cannot find the ship. We pull over to talk about it. After envisioning the cost of renting a semi-truck sized container and placing it on a ship for Roatan, we give up on that idea and also opt against the idea of staying in La Ceiba for the holidays. Tela, the next Caribbean coast town has reported problems with armed theft and worse on the beach by roaming gangs of youths. Wanting no part of that we ride back to the interior of Honduras looking for a hotel that will give us time to figure out what to do next.